IADC, along with six other oil and gas industry trade associations, submitted a joint letter on 17 July to BSEE with comments on the agency’s Proposed Blowout Preventer Systems and Well Control rule. IADC supplemented this letter with a separate letter, which specifically addressed the concerns of drilling contractors. Specifically with regard to drilling contractors, IADC identified three major areas of concern with the proposed rule. These include its prescriptive requirements that go beyond international standards and will negatively affect the US market for MODUs; the significant costs to drilling contractors to comply with the rule, which were not accounted for in BSEE’s impact analysis; and the inspection and more massive BOP equipment requirements, which will negatively impact operations. “IADC welcomes any opportunity to work collaboratively and constructively with BSEE and Director Salerno, as we believe in the need for better regulation. That is regulation that is fair, fit for purpose, practically implementable and affordable for our industry. We understand the weight of expectation on this proposed rule, given that well control is a key area of public concern, and we respect the direction of travel set by BSEE. However, the lengthy period of gestation of the rule is regrettably unmatched by the very short period for public comment on it, as the rule is both technical and wide-ranging,” said Stephen Colville, IADC President and CEO. Training industry personnel for well control proficiency is critical, particularly as the area of well control has been a subject of scrutiny in the years since Macondo. WellSharp is IADC’s answer. WellSharp was introduced in April 2015 to provide the definitive standard for well control training and assessment. Industry experts contributed thousands of hours of their time, on a volunteer basis, to contribute to its development because they believed in getting well control training and assessment right. WellSharp requires a more rigorous assessment processes and longer courses, proctored tests and additional resources – all of which come at an increased cost. The value of the training is believed to be worth the cost, as training is an investment that ensures the safety of the industry’s people, equipment and the environment, guarding against risk. The accredited providers who have transitioned their programs to comply with WellSharp standards deliver 70 to 80 percent of all IADC well control training worldwide. IADC continues to review test questions and has established a formal appeals process for disputed test questions and answers. Since its launch in April, IADC has continued to refine WellSharp. Important database reporting features for training providers to monitor their own performance have been added. Currently, work is underway to implement an offline test for training providers who do not have internet access; translate the test into a total of 15 languages; and make online practice tests available. For more information about WellSharp, please visit the IADC Accreditation website. IADC recently issued an updated edition of the Federal Regulatory Actions Impacting Offshore Drilling Contractors. Released semi-annually, the report details federal regulatory actions that could impact offshore drilling activities. The report reflects regulatory actions announced in the Federal Register or other available sources through June 2015. The report can be accessed via IADC’s website. Multi-user licenses are now available for IADC eBooks through Thomson Reuter, a new publishing partner for the Association. While IADC eBooks remain available through www.IADC.org/ebookstore, Thomson Reuter makes possible print on demand, as well as multi-user licenses enabling as many as nine people to access the same electronic book. Go to http://www.techstreet.com/publishers/3264. Solutions are also available for organizations wishing to enable more than nine people to access IADC eBooks. For more on this option or for any questions about the IADC eBook program, contact Mike Killalea, ext 222 (mike.killalea@iadc.org). IADC 2015 Chairman Ed Jacob, who is director, president and chief operating officer, Independence Contract Drilling, spoke at the South Louisiana Chapter meeting on 27 July in Lafayette. In his address, which focused on current IADC initiatives, Mr. Jacob discussed the global energy market, noting, “It is easy to succumb to the pressures of the market and choose to take short cuts or make business decisions that seem to be the easiest and least expensive, but become ‘stepping over dollars to pick up nickels’,” urging members to act now for the industry’s future best interests. Pointing to safety statistics that indicate a 98% drop in LTI rates between 1968 and 2014, he noted that while drilling operations today are significantly safer than in previous generations, employees are still getting hurt. “The numbers may be lower than they once were, but the percentage points represent people. People who returned home with injuries, or not at all. And that is unacceptable. We have a duty to arm our employees with the knowledge and skills they need to do their job safely and efficiently,” Mr. Jacob acknowledged. In his prepared remarks, Mr Jacob discussed the importance of industry safety and that a focus on training and education is key to ensure success. He then detailed several of IADC’s current initiatives which target personnel training and competence, including updated information on the new well control training and assessment program, WellSharp, the Workforce Attraction and Development Initiative (WADI), the availability of the IADC Safety Toolbox and the newly updated and available IADC Deepwater Well Control Guidelines and IADC Drilling Manual. Mr Jacob also outlined activities within the Policy, Government and Regulatory Affairs (PGRA) division of IADC, highlighting the ongoing advocacy work with regulators and legislators on behalf of IADC members. IADC South Louisiana Chapter members. From Left to Right: Bob McKenzie, Chapter Membership Chairman; George Sauzer, Chapter Assistant Membership Chairman, Red Wing Shoe Company; Ed Jacob, IADC Chairman; George Courville, Chapter Chairman, Nabors Drilling; Bob Dunn, Chapter Vice Chairman, Megadrill Services Limited; Stephanie Picard, Chapter Treasurer, Charter Supply; Monique Fritz, Chapter Secretary, Diamond Offshore Drilling; Carol Hale, Chapter volunteer, Lafayette Desk and Derrick. 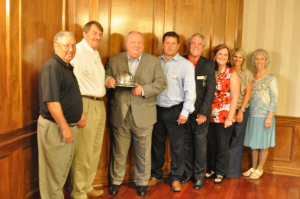 For more information about the IADC South Louisiana Chapter, please visit the website. The US Environmental Protection Agency recently issued a proposal for a voluntary Natural Gas STAR Methane Challenge Program, which would provide a new mechanism through which companies could make and track ambitious commitments to reduce methane emissions. The program is based on extensive stakeholder outreach and reflects a revision of the EPA’s previously proposed framework, Gas STAR Gold, for an enhanced voluntary partnership in the oil and gas sector after it reached out to stakeholder groups for comment. The proposed program will create a platform for leading companies to go above and beyond existing voluntary action and make meaningful and transparent commitments to yield significant methane emissions reductions in a quick, flexible and cost-effective way. EPA will host a series of Methane Challenge Webinars to provide details about the proposed Methane Challenge Program. Each webinar will address specific oil and gas sectors. EPA intends to launch the Methane Challenge Program later in 2015, possibly in conjunction with the next Natural Gas STAR Annual Implemtnation Workshop in November 2015. The EPA is still expected to propose regulations later this summer on methane emissions, with the goal of reducing oil and gas industry methane emissions by up to 45 percent from 2012 levels by 2025. IADC recently launched Gateway™, the first accreditation program for training providers launched through the Workforce Attraction and Development Initiative (WADI) under the IADC Workforce Development Committee. The Gateway accreditation program is an output of WADI, which was initiated in 2012 to bring together institutions of higher learning with industry partners to develop course curriculums for entry-level, new-hire oil and gas industry candidates. As a result of the WADI collaboration, the Introduction to Oil and Gas Training Program was developed to help companies connect with colleges, training providers and other organizations to attract, hire, train and promote onshore and offshore oil and gas workers worldwide. The training program offers a standard baseline curriculum comprising RigPass, WellSharp Awareness-Level well control, a general introduction to the industry, behavioral training (human factors), a module on rig life, technical math, rigging basics, electrical and fluid safety, industrial practices and considerable hands-on training. The program is designed to better prepare new employees for working on a rig, thereby helping companies improve safety culture in the field while reducing turnover rates. More information about the Gateway accreditation process and the Introduction to Oil and Gas Training Program can be accessed via the IADC Accreditation Website.